In theory, face masks are meant to be a weekly or bi-weekly treatment to deal with a specific issue you have with your skin. The results are meant to be near enough instantaneous. And the process should feel like a little pampering treat rather than like a medical treatment. You can of course use them more/less often depending on your skin's needs and, of course the all important factor, how much time you have. Although multi-masking is very popular (where you apply a few different masks to different areas of your face at the same time) I have taken more of a liking to multiple masking (where you use a mask, cleanse it off, then use another, then sometimes even another) for a more full-on treatment session. 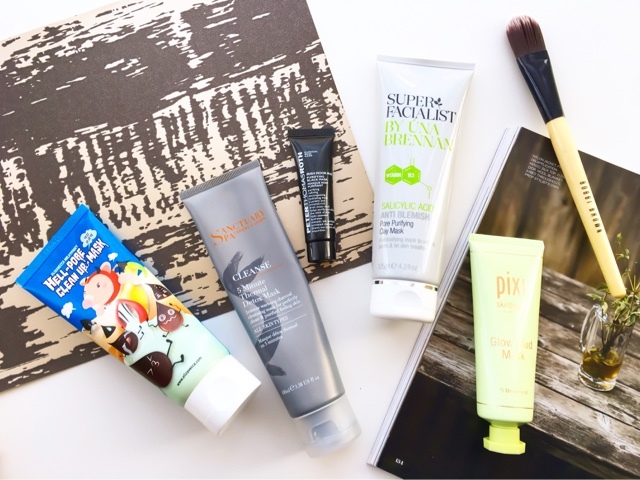 As a busy mummy who barely gets the time to use masks, you'd think multi-masking would be better for me, but I prefer making the time once a week to really focus on my skin concerns and because I have so many issues, I find it better to apply each mask to the whole of my face rather than only on certain areas. So I'll usually use an exfoliating mask followed by a pore cleansing mask followed by a hydrating mask (good old Triple Masking courtesy of HiddenHarmonyWorld). My skin is combination-oily, with some random dry patches, bumpiness in areas, a helping of dehydration and large gaping pores that are easily clogged. So when I use a mask, I need it to deal with one or more of these skin concerns (I don't ask for much do I?). My favourite masks can be grouped into 3 categories - exfoliating/brightening, decongesting/clarifying & protecting/hydrating. A lot of them do similar things but for one reason or another, they are all indispensable to me. Whether it's some sensory aspect, like the scent or texture of one or the other, or the ease of wiping off or even the packaging makes me want to keep these on rotation despite some of them being almost the same. I'm sure some of you understand what I mean. This was one of the first 'fancy' masks I ever bought and it's been a favourite since. This cream mask contains glycolic acid which helps to break down the bonds that keep dead skin cells attached to the skin's surface. I love using this before I have to attend a special event because it preps my skin so nicely. It exfoliates the skin's surface and reveals fresh skin in only 20 minutes. The cream texture is easily removed and doesn't irritate the skin. This is great for sensitive skin in need of a radiance boost. This one is very similar in results to the Caudalie except it has a gel texture and smells like orange soda. The fruit acid complex, which includes lactic acid and glycolic acid, work to resurface the skin effectively. This is another great one to prep skin for flawless makeup application. 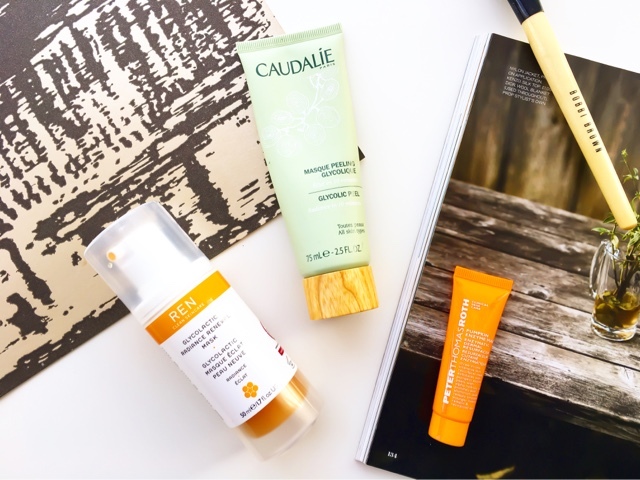 As I find this slightly more active and because it leaves my skin slightly more red than the Caudalie, I tend to use this as part of a Triple Masking Session so I can follow up with more soothing masks. I don't think its necessary to have both of these but I really can't choose between them. I'm still working my way through this sample but I know it's one I'll be purchasing full-size of soon. This has a slightly gritty texture and contains pumpkin extract and boasts 3 levels of exfoliation - enzyme, chemical and physical exfoliation in one. The sweet pumpkin scent is somehow soothing (while making me feel peckish) and the product tingles slightly when it's on. You can rub this around on your skin before removal for some extra exfoliation or you can wipe it off with a damp cloth to reveal a fresh, radiant complexion. Again, if you have this, you don't actually need the previous two. I'm starting with what is quite possibly my favourite mask out of them all - this charcoal and clay based mask leaves my face feeling fabulously clear, looking brighter and is easy to remove (always an important factor)! It contains aloe vera, Dead Sea mud, jojoba, rosemary and ginseng which work together wonderfully to soothe, heal and rejuvenate which extracting all impurities from inside the pores and on the skin's surface. It has a lovely scent and changes colour as it dries most satisfyingly. Not surprisingly I've used a tube of this already and will be buying a back-up of my current tube soon. This is my go-to product when I suffer from any breakouts or when my skin seems too oily and imbalanced. Although the scent is ridiculously strong, it is such an effective mask that it's one of the few products I'm willing to overlook the smell on. This mask will literally draw out any impurities and excess sebum with ease and leave your skin feeling rejuvenated and unburdened. I add a couple of drops of a rich facial oil to the mask before applying to make it easier to remove otherwise it can be a bit of an ordeal to scrub it off. Aside from the few seconds of adjusting to the strange warming sensation, this gel-like mask only takes a few minutes to transform the skin. It contains oil absorbing kaolin clay and a mix of essential oils and is great for clearing the skin while being soothing. This is the mask I use when I have very little time but my skin needs some remedial attention. I also rely on this for a mid-week skin detox. This clears up any congestion in my pores and leaves my skin looking brighter and feeling softer. If you have little to no time to deep cleanse your skin, then this is the perfect choice for you. I call this the peel-off pore gunk extractor and mini facial wax in one! I kid you not, this will pull out any build-up in your pores be it sebum or black-heads and get rid of any peach fuzz along with it all. You have to be very careful to avoid your brows when you apply it for just such a reason. While this is effective and can be used all over the face, I prefer to use this as a last resort only on my t-zone when things are in a really dire state. It peels off satisfyingly but be warned, it can be fairly painful the first couple of times. The results are undeniable. This reminds me a lot of the Pixi mask in that it doesn't strip the skin and effectively clears out the pores without being a mean feat to remove. Activated charcoal and volcanic ash work alongside black hijiki seaweed for an incredible detoxifying facial at home. It draws out impurities, balances oils, cleanses, and leaves skin looking radiant while fine lines and pores appear smaller. This is great for acne prone skins to use regularly to ensure that pores remain clear and breakouts are minimised. I fell in love with this mask straight away and it wasn't just because of the scent that mysteriously takes me back to my childhood. This active mask will instantly hydrate and soothe your skin and is made with Manuka honey which has great antibacterial properties making this mask perfect for keeping skin clear or helping breakouts along as a spot treatment. I love that it leaves my skin super clean and nourished and it is really a treat to relax with this mask on. This mask would be great for anyone and everyone if you ask me, but if you're blemish-prone then you need this in your skincare stash. I had to include this mask because it's actually the one I've used the longest out of all of these. It does everything and only needs a few minutes to work (oh and just so happens to be the most affordable too!). Green clay and kaolin help to clear out any impurities, willow bark to make the skin appear more radiant and avocado oil to soothe and moisturise the skin. This has a very strong fruity scent though, so if you're not a fan of strong scented masks, beware! 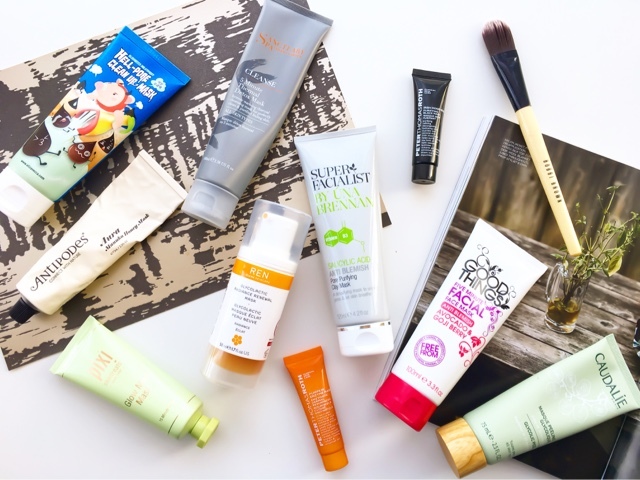 I hope you enjoyed reading about my Top 10 Face Masks - let me know if any of these are in your favourites too or if there's any here you'd love to try. What kind of masks do you steer towards the most? Are there any I need to try out?